Michael Stone, husband, father and respected author, is a man crippled by the mundanity of his life. During a business trip to Cincinnati, he discovers a possible escape in Lisa, who may or may not be the love of his life. From the brilliant minds of Charlie Kaufman (Eternal Sunshine for the Spotless Mind, Being John Malkovich) and Duke Johnson (Community episode, Abed’s Uncontrollable Christmas), this stop-motion animation film features the vocal cast of Jennifer Jason Leigh, Tom Noonan and David Thewlis and a stirring strings-based score by Carter Burwell. 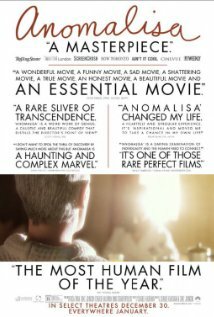 The darkly comedic and surreal stop-motion journey of a man’s long night of the soul, Anomalisa confirms Charlie Kaufman’s place amongst the most important of American filmmakers, and announces Duke Johnson as a major creative force. Shown with Low/Fi.